includes an LED fire (2 x AAA batteries required) and large soup cauldron. Price is 41% below the initial Playmobil retail price, a € 8.94 discount! The Ogre with Ruby (9409) Playmobil set is available from the sites below. However, they do not offer delivery to your selected region. 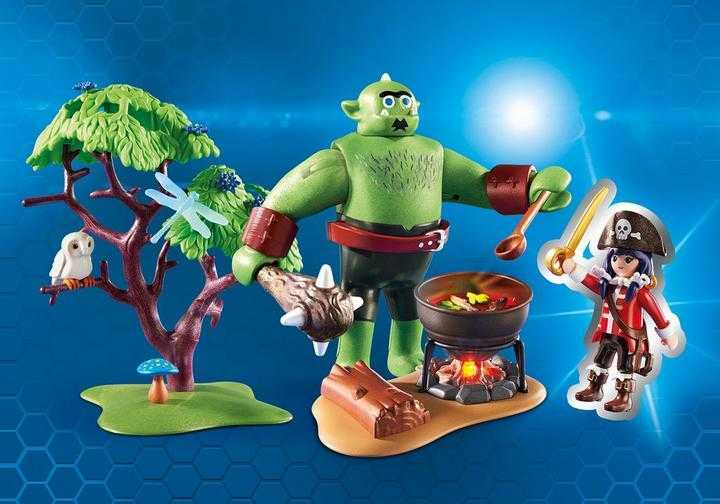 The Ogre with Ruby (9409) Playmobil set is no longer directly available from the sites below. However, 3rd party partners of these sites might still have the set available. The arms and hands of the ogre can be turned in all directions. The club of the ogre can be attached to the belt. After pressing the button, the LED fireplace will start to flicker slowly before becoming a powerful ""fire"". In combination with the LED fireplace, the contents of the pot light up.